the night before surgery. The consent forms are signed and Albie’s surgery is scheduled for an 8am start. I really do just want to hold Albie in my arms all night. But I also don’t want to worry him. So our boy is bathed, in new pyjamas, clean asleep beside me. I need to go look at him some more so this will be short. Tomorrow he’ll go into the theatre at 8am, for at least six hours. In the middle of that, his heart will be stopped for 2-3 hours while they do the Rastelli repair. When he is off bypass, when his heart has been started and is beating again, they will call us. Waiting for that phone call is going to be real tough I know. Tears well in my throat at the thought…..Anyway, after they’ve called, I will update the blog briefly so you know he is off bypass as well, particularly as it will be the middle of the night in the UK . Thanks again for the oodles of love and support we’ve been receiving, its a beautiful, beautiful thing. 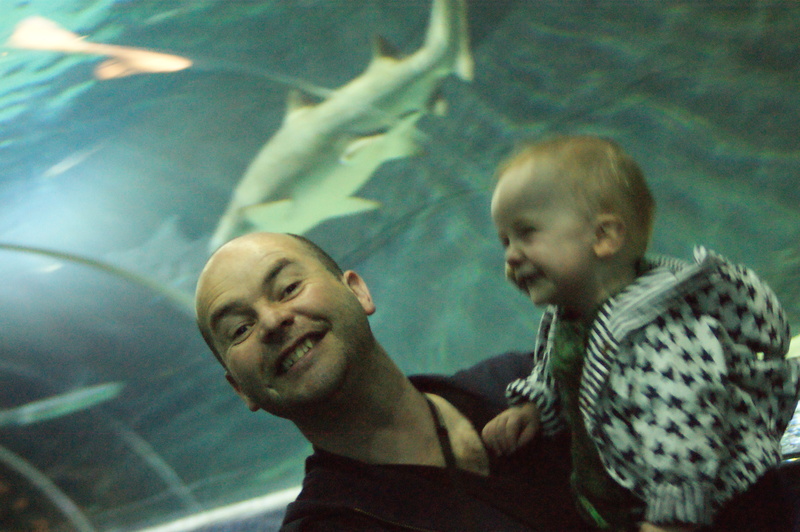 Oh, and we did go see some sharks the other day. It was great fun. As you can see below. Oh my boys. No matter how tough the journey seems tomorrow, shine bright as you already know the outcome. Our little family has followed and been so inspired by you and the boys – you are all in our thoughts! From little girl Albi to little boy Albie! All our love and prayers are dedicated to you three today, Sarah, Alan and Scout. All the very best. Lots of prayers your way today. In Swedish Albert means strong as a bear and of course lets not forgot husband to the great Queen. On another note its also a name of a peach in Canada so you know…. Big love and purrs from the Walker-Simmons. Keeping you in my thoughts. Lots and lots of good thoughts. Dear Marcus, Sarah & Albie. We are sending you lots of positive thoughts and warm hugs from Newtown. Love from Ed, Heidi & Lucy. Thinking of you guys – hope everything is going well and Albie will be up and running around Kelly Tarlton’s next time!! We’re all thinking of your whānau Marcus. Kia kaha e tama! Arohatinonui nā te whānau Matairangi Clyde Quay.